Has the private equity industry gone topsy-turvy? Record dry powder has pushed valuations to new highs, while fund sizes continue to grow larger – raising concerns over the volume of capital entering private markets. Fund managers, however, insist that they are no longer bound by traditional cycles, citing more diverse offerings, greater variety in fund terms and durations, and innovations in delivering returns. Leading investors contemplate this situation and predict what comes next. How are global macroeconomics and geopolitics developments impacting investors’ sentiment? How have the private markets developed in fundraising and investments in the past 12 months; and what new structures have entered the market? What are the most significant product innovations; and how do they benefit GPs and LPs? What will be the biggest changes for the industry in the next five years? Where are the drivers of this newfound interest in Taiwan; and how can the most attractive opportunities be accessed? Why have company founders turned towards private equity; and what are the best ways to align management? How can private equity support industry consolidation and restructuring? How can private equity help companies go global and access new markets without giving up core local business? Whether it is IoT, AI, big data, or blockchain, technological advances are redefining industries and catalysing business transformation – sometimes upending investment theses and value creation strategies. To deliver alpha, GPs must address disruption in different industries and harness the power of technology to drive operational improvement. Our industry experts discuss how private equity firms can help companies navigate technology shifts to create true value. Which technologies are already impacting Taiwanese businesses; and which sectors present the greatest risks and rewards? How can technology be factored into the initial investment thesis? How has technology impacted value creation plans; and what are the specific examples? What human talent is required at the fund and portfolio level; and will Taiwan take advantage of its human capital edge and proven tech R&D capabilities? The spirit of Taiwanese entrepreneurism is back. This time with a new generation of startups targeting the new digital economy. With its pool of smart entrepreneurs, a history of proven R&D and manufacturing capabilities, as well as public and private resources, Taiwanese startups are in an ecosystem that is fertile ground for success. Yet Taiwanese startups lag behind their regional counterparts in international recognition, valuation, and execution. Can venture capital investors supercharge these companies? Our panel of successful entrepreneurs and venture capitalists discuss how to ramp up Taiwan's VC ecosystem. Does Taiwan have what it takes to create a startup ecosystem for world-class companies; and in which industries can local ventures excel? What new government policies and initiatives are in the pipeline; and how will these benefit Taiwan's VC industry? How can Taiwan create its own unicorn(s)? How can LPs support the local VC industry; and is there a role for corporate investors? expertise? Or do you try a combination of both, and if so, which geographies do you choose, and how can you get the balance right? A panel of leading LPs discuss. 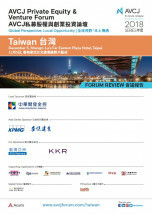 How do LPs view Taiwan as an investment destination and the potential of the domestic GP market? What strategies are used to build a diversified portfolio? It may not be a well-known fact, but Taiwan is one of Asia’s most attractive fundraising destinations. The alternatives-active Taiwanese institutional investors, including the newer LPs – the evolved HNW community, will continue to allocate large sums of capital into private equity partnerships. The local pool of LP capital will also increase as the government encourages private capital investment in the local economy. With regulators considering raising the insurance companies’ alternatives cap from 2% to 3% of AUM, Taiwan’s ranking within the global LP community is bound to increase substantially. Domestic LPs discuss the outlook for fundraising from Taiwan. What are the latest developments for local LPs investing in alternatives? Which asset classes, geographies, and strategies interest LPs the most; and are more LPs making larger allocations to Asia? What are the co-investment and direct investment opportunities in the regional market, including Taiwan; and how do LPs approach them? How should new LPs approach private equity, credit/debt, secondaries, infrastructure, and other alternative asset classes?